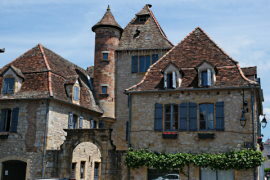 Curemonte (just outside the Dordogne in the Correze department) is one of the "plus beaux villages de France" (most beautiful villages of France). It stretches out along a hilltop overlooking the valleys of Sourdoire and Maumont. 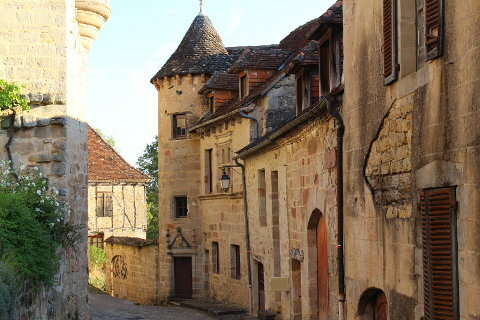 The charming village of Curemonte is dominated by its feudal castles. There are three in the village; the Chateau de St Hilaire (14-15C), the Chateau de Plas (15C) and the Chateau de la Johanne. Two of the chateaux - Saint Hilaire and Plas are linked internaly by one of the thick castle walls. These two were owned in 1940 by Bel Gazou, daughter of Colette. 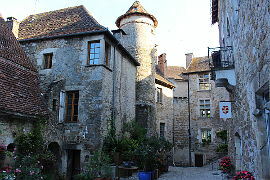 Colette stayed here for a while during the 2nd World War and mentions Curemonte in one of her books -' Journal à Rebours'. The round and square towers of the castles dominate the village and add drama to its skyline. There are also three churches. 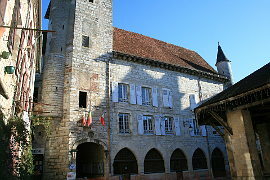 L'eglise de la Combe is roman in style and dates back to the 11th century. It is very simple and attractive. This church lies on the outskirt of the village in a small hamlet. The church in the centre of the village dates from the 12th century. Spread out around these are narrow streets, almost too narrow for a car to squeeze through in places, and lovely stone houses built of a honey coloured stone. Some of these are 'noble houses' owned by officers who were employed by the feudal lords who owned the chateaux. Some of these houses also have turrets adding to the fortress-like impression of the village. The rooves are an interesting mix of terraccotta tile and slate tiles and throughout the village there are a scattering of turrets and carved doorways to make exploring Curemonte a pleasure. Curemont's halle dates back to the begining of the 19th century and shelters a 16th century cross. 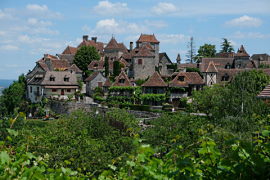 Curemont is officially classified as one of the most beautiful villages in France, one of several in this part of France. 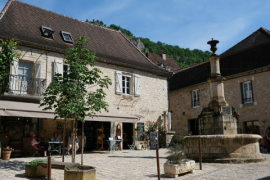 As well as being beautiful it sits above the surrounding Correze countryside and the views from the village are excellent. It is as you approach or leave Curemonte that you can best appreciate the series of defensive walls and towers of Curemonte. Stop your car down the road for a look at the lovely skyline the village offers. 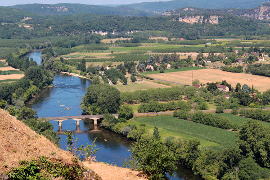 Curemonte is only 10km from the Dordogne river and makes an excellent base for visiting both the Dordogne region and the Correze. 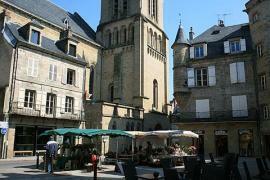 Nearby Martel is one of our favourite towns in this area and is also home to many towers! 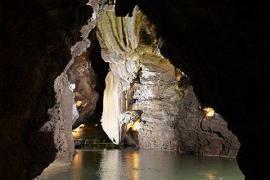 Another favourite is Carennac which like Curemonte is classified as one of the most beautiful villages of France.